AUC’s Board of Trustees approved a balanced budget for the 2018-2019 academic year at its meeting held in Cairo in February 2018. Keeping the annual tuition increase substantially below Egypt’s current inflation rate, the Board approved a 5 percent increase to undergraduate and graduate tuition fees. AUC has also focused on increasing financial assistance to attract and retain top performing students by allocating 20 percent of gross tuition to scholarships, fellowships and financial aid. The University also introduced new measures –– an early payment incentive plan and student tuition loans –– to help families pay tuition. In addition, the approved budget earmarks more than $5 million directly to support academic initiatives and the student experience to enhance AUC’s quality of education. What is the size of AUC’s budget? 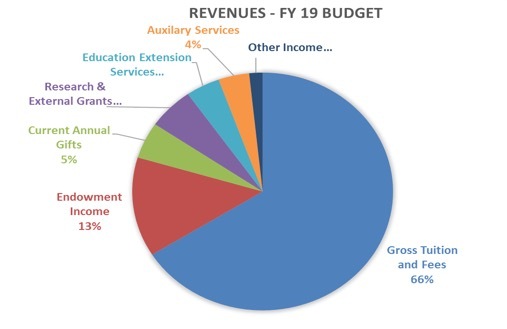 The size of AUC’s budget is approximately $174 million. What are our main sources of income? How do we spend our budget? The University sets tuition, which is approved by the Board, through a detailed process that includes weighing the need to balance the budget -- which the Board approved as $173.7 million for next year -- and improve the quality of education while helping keep our tuition as low as possible for our families. 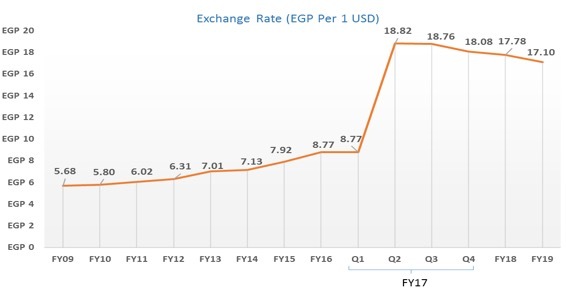 With the floatation of the Egyptian pound more than a year ago and its subsequent sharp loss of value, AUC was confronted by two opposing trends in tuition, depending on the currency. In the last five years, AUC’s tuition in U.S. dollars has continued to decline. In other words, a student would be paying less in dollar terms in 2018 than in 2013. Looking at tuition in pounds, on the other hand, shows a steep rise. Since a significant portion of AUC expenses are in dollars, the mismatch is difficult. In setting the 2018-2019 tuition fees, the Board of Trustees kept the annual tuition increase at 5 percent –– significantly below Egypt’s inflation rate, which has reached nearly 24 percent. AUC understands the financial pressure on families in these challenging times, and that’s why it has kept the annual tuition increase to a minimum. Tuition for international students remains at current levels since these fees are already considerably higher than the fees paid by Egyptian students. To know more about tuition and fees, click here. What are the new tuition payment incentives? Why has AUC taken such initiative? Two new initiatives, an early payment incentive plan and student tuition loans, will be implemented for the Fall 2018 semester. In addition, the current tuition installment plan will continue. AUC has introduced these incentives to assist students and parents in fulfilling their education financing obligations. Through the early payment incentive plan, a 2 percent reduction in tuition fees per semester for returning students is provided for tuition fees paid in full 60 calendar days in advance from the starting date of classes. For the student tuition loans, AUC is acting as a facilitator with local banks to offer loans to parents and graduate students to cover the cost of student tuition. The loan proceeds would be provided to AUC at the beginning of the semester or academic year to cover the tuition fees. The loan arrangement would be directly between parents and the bank. The University would only be involved in communicating the details of the bank proposals to students and their parents and in assisting the banks to deliver their marketing campaigns. What are the different methods available for paying tuition? AUC offers various methods for paying tuition: 1) cash, 2) bank drafts or certified checks, 3) online payment, 4) bank transfers, 5) Commercial International Bank’s AUC branch MasterCard payment (credit or debit card) and 5) New York Office payments. Online and electronic payments are encouraged to facilitate ease of payment and reduce processing time. Yes. Not only has the University kept the tuition increase far below the national inflation rate, it has also focused on scholarships and financial aid to address affordability in Egyptian pound terms. For the 2018-2019 academic year, financial assistance –– which includes scholarships, fellowships and financial aid – is increasing to 20 percent of gross tuition compared to 18 percent of gross tuition in the current academic year. How much of AUC’s income does tuition represent? And what does this mean? Tuition represents only 65 percent of AUC’s revenue. This means that tuition does not fully cover the cost of an AUC education for any one student. Every student at AUC is subsidized because no student pays more than 65 percent of the cost of his or her education. In addition, about 50 percent of our students receive financial assistance to study at the University. This all makes philanthropic giving to support AUC of utmost importance. An endowment is a permanent source of funding for the University. 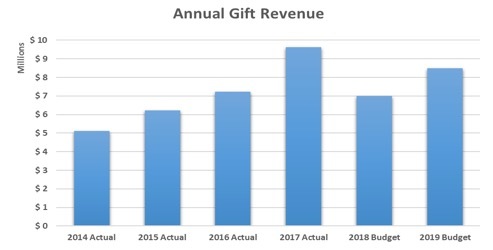 The fund's assets, which are comprised of philanthropic gifts and other assets, are invested and each year a portion of the returns from this investment is paid to support the mission of the institution it supports while another portion is used to increase the value of the endowment fund over time to ensure intergenerational sustainability. AUC manages more than 100 endowed funds to ensure that donor requirements are met and that the assets of these funds are invested to grow over time. The AUC endowment has historically earned comparable returns with our peers. How large is our endowment? As of December 2017, our endowment is valued at $541 million. What is AUC's spending policy, and how was the spending rate determined? 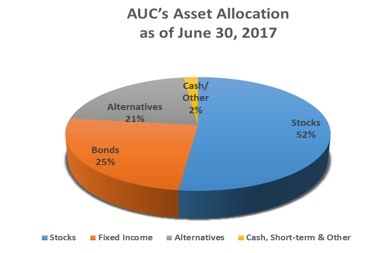 Prior to FY18, AUC's annual spending policy allowed the University to spend up to 5 percent of the rolling three-year average market value of endowment funds, calculated as of December 31 of each year. This spend rate has been adjusted to 4.5 percent for FY18 going forward. The spending policy was developed to preserve the purchasing power of the endowment on an inflation-adjusted basis. 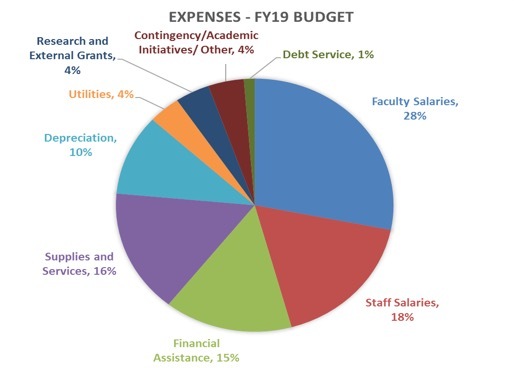 In FY 2019, the University is budgeted to spend $23.29 million from the return on its endowment. How is the endowment portfolio structured? AUC’s endowment is constructed as a diversified portfolio and invested across different asset classes such as stocks, bonds, and alternatives. This diversified approach is designed to maximize return based on a prudent level of risk. How does AUC manages its endowment? AUC’s investment office selects and monitors professional, third-party investors that specialize in managing institutional assets. AUC’s endowment fund is governed by an Investment Committee of the Board of Trustees that reports regularly to the Board. The trustees who serve on this committee are well qualified to act as fiduciaries of these funds. How have AUC’s costs changed over time? How has revenue changed at AUC? ​What effect does exchange rate change have on AUC? The University incurs a significant portion of its expenses in U.S. dollars, particularly in faculty salaries. Therefore, a depreciation in the Egyptian pound make these costs more expensive. 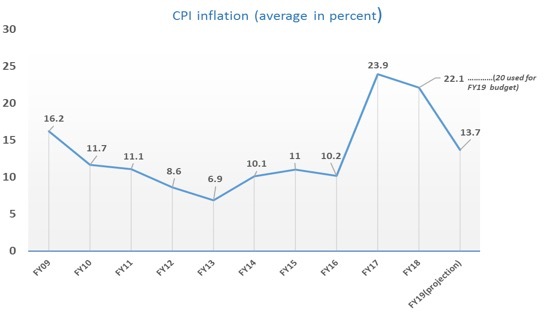 How does inflation affect AUC's finances? The University must purchase a diverse set of goods for its operations. Inflation reflects an increase in the price of these goods thereby making it more expensive to make important purchases.